I ignored Cezar, even as he started shouting, “Hey! Hey! Hey, lady!” at the top of his lungs. I quickly ended my call with Marner and turned to him, furious and flustered. “What? Are you a child? You could see I was on the phone. Give me a second!” Just because he was dead didn’t mean he was allowed to thumb his nose at any and all etiquette. I was pretty sure he had eternity, but unlike him I had manners and wasn’t going to point that out. “What can I do for you, Mr. Wozniak?” Maybe if I were exceptionally polite he would respond in kind. So much for politeness. I accelerated onto the highway, irritated that I had to spend the next forty minutes in the car with this guy. “And I told you, I can’t help you. I’m not a private investigator or a cop. I don’t know anything about your life or the mob or whatever. If you were shot in your house, and they disposed of your body instead of leaving it there, then I wouldn’t even know where to begin. Sorry. Can’t help you.” And to further punctuate my statement, I turned up the radio. I had no response to that as I glanced in my rearview mirror to merge onto the highway. To be honest, Cezar looked like he would be full of gases. “Maybe they took your boat out and dumped you.” He had a dock, though I hadn’t seen a boat in the slip. USA Today Bestselling author Erin McCarthy has written over sixty novels in romance and YA fiction. In first grade, Erin won a Young Novelist contest with a paranormal romance story about a witch in training who used a spell to enchant her classmate, and she had been hooked on books ever since. A RITA finalist and the winner of the Reluctant Young Reader award from ALA, she is a member of RWA, Horror Writers of America, and Ohioana. 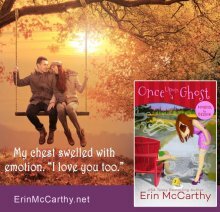 Stop by www.erinmccarthy.net for upcoming releases.